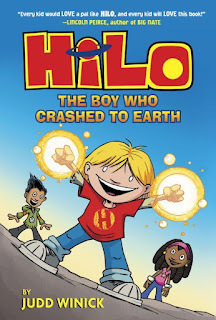 I have been having so much fun reading aloud Hilo: The Boy Who Crashed to Earth with 3rd and 4th grade students. The kids are loving the laugh-out-loud moments, and I'm loving how much active thinking they're doing. Comic books are terrific fun, but they also engage readers as they build a sense of the story, the characters and the author's voice--just like readers do with any type of fiction. A parent recently asked me what questions I ask while we're reading aloud, so I thought that I'd share a little here. I start before we even open the book and ask: What do you notice on the cover? I wonder what this story's going to be about? Do they notice Hilo's hands and think he might have superpowers? Do you think all three kids fell to Earth? This sort of wondering is important to start kids thinking, to start making predictions, to hook them into the story. DJ's story starts right in the middle of a chase scene, the first day he meets Hilo. 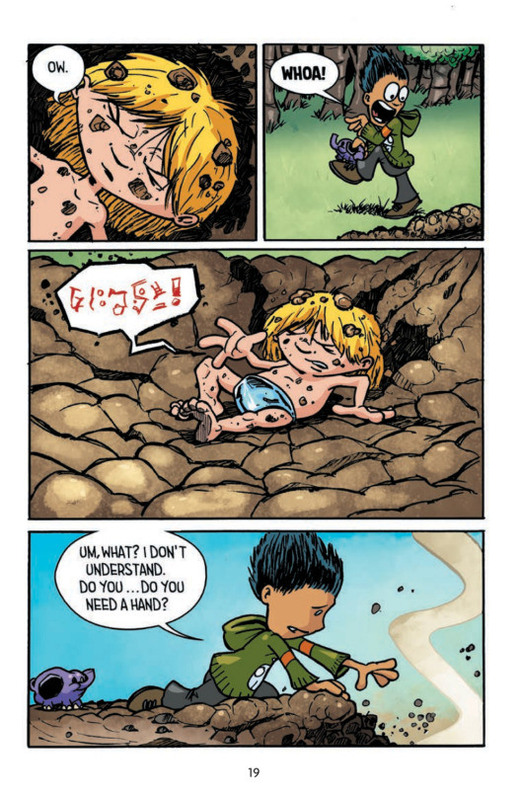 My students love Hilo's energy and his optimism--and they totally love Winick's jokes about how Hilo doesn't know anything about life on Earth, because he's just fallen from another world. Hilo is funny! He shouts, "Ahhhh!" whenever he meets someone and loves burping! Hilo has superpowers in his hands -- he absorbed DJ's vocabulary. DJ misses his friend Gina--he said that the only thing he was good at was being her friend. I think that Hilo is going to be DJ's new best friend. DJ seems like a good friend, because he offers to help Hilo right away -- reaching his hand down to help him out of the hole. "Do you need a hand?" At a few points, we stop to talk about specific language that Winick uses. For example, Hilo says that his memory is like a "busted book" with pages ripped out. This helps readers understand why Hilo is so naive, why he doesn't remember his name or where he came from. "My memory is a busted book." It's important to acknowledge when kids are inferring, or reading between the lines to build meaning. When Hilo has a dream, the story quickly switches to the lab with Dr. Horizon. We pause, and I tell my students: Wait, I'm confused. Who is this new character? Why is he wearing a white coat? Why does the border look different here? What's happening? As we build the story in our minds, it's important to retell parts of the story. Today, we looked at the first page of the chapter and then actually turned back a page to look and think. I asked: What just happened here? How is DJ feeling? Why? Empathizing with a character helps readers keep tuned into the emotional elements of a story. Sometimes we do that with our voices when we read the dialog. Sometimes we sigh when a character looks like they're sighing. Sometimes we shout, "Whoa!" when a character is surprised. As we get into the story even more, we develop a more complex understanding of the character. We ask ourselves: Why is Hilo doing this? What is he feeling? I wonder if DJ and Hilo are changing at all? We pay attention to what the characters are trying to achieve, and what gets in their way. When we read aloud with developing readers, we need to give specific signals that it's time to pause and think. Building meaning is even more important than figuring out what the words say. The review copies were kindly sent by the publisher, Random House, and we have bought multiple copies for our school library and classrooms. If you make a purchase using the Amazon links on this site, a small portion goes to Great Kid Books. Thank you for your support. In a recent interview in The Horn Book, Adam Gidwitz talks about his teaching days as being filled with "serious fun" -- I love that concept. Yes, kids love having fun, laughing, sharing silly or gross stories. They also love to dig into serious topics and want us adults to ask for their opinions. 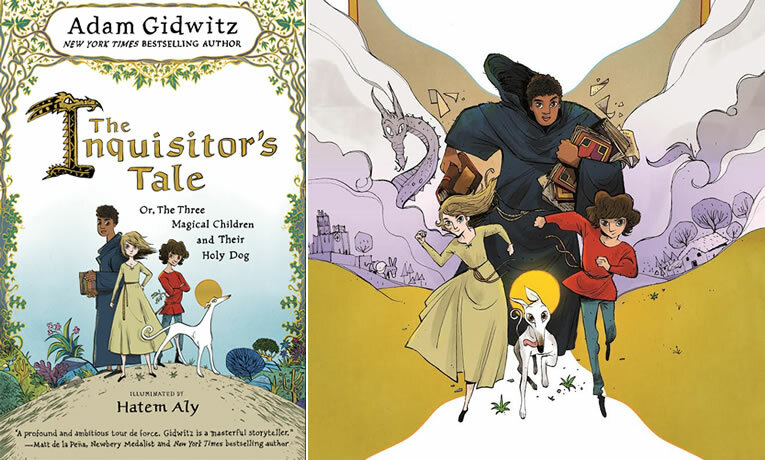 Gidwitz has legions of fans for his exciting, engrossing retellings of Grimm's tales. In his newest book, he tackles medieval life, religious intolerance and the power of deep loyal friendship--all with a healthy dose of fun, adventure and brilliant storytelling. We begin our tale at a travelers' inn, hearing about three children fleeing for their lives from Louis, the powerful king of France (for history buffs, this is Louis IX, commonly known as Saint Louis). Each child is ostracized, isolated in their own way, until fate brings them together. Jeanne's neighbors worry that her seizures and visions mean that she's possessed by witchcraft. When her dog Gwenforte, who saved her life as a baby, comes back to life, Jeanne escapes into the forest. Jeanne meets up with William, a young African oblate (a monk-in-training), and Jacob, a Jewish boy whose village was burned to the ground by an antisemitic mob. Each child is wary and full of fear at first, but they grow to trust each other. In the High Middle Ages, life was defined by class and religion--completely different from today. And yet, was it? It was a time full of intense distrust of "the other," people who belong to a different religion or social group. And at the same time, a time marked by rapid social changes, spurred by urban centers, economic development and trade across boundaries. What will draw children to this story? 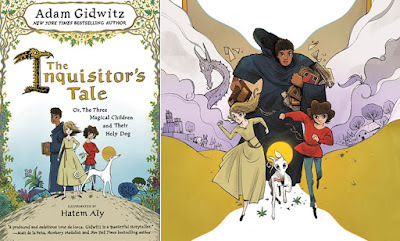 They will love Gidwitz's storytelling as William battles the fiends in the forest, or Jacob cures the farting dragon by realizing stinky cheese is setting his farts on fire. They will love the way Gwenforte the greyhound is loyal to the children, guiding and protecting them. 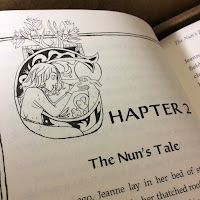 Young readers will also connect emotionally to Jeanne, William and Jacob--feeling often as they do, that no one understands them except for their loyal friends. Hatem Aly's illustrations provide both humorous relief and concrete grounding for this complex story. A portion of the famous Unicorn Tapestries depicting a hound on the hunt. 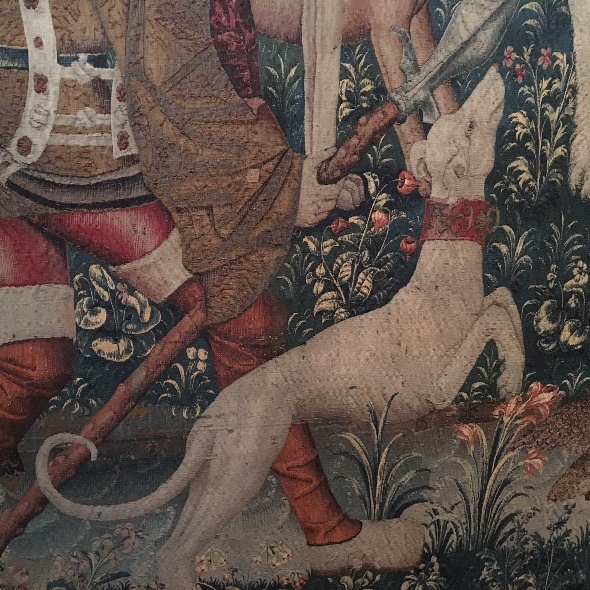 This dog partly inspired Gwenforte the Greyhound, the holy dog. Just as importantly, children will be drawn into this story where young heroes decide to take a stand for what's right, fighting against ignorance and intolerance, proclaiming that collaboration and friendship is not only possible across social groups but thrives among different social groups. Society is still struggling with these very issues today. One early reader told me, "I'm loving this story because it's full of so many different people. Most stories I read have characters who are all the same. Here, everyone is different and that's so interesting." Serious fun. Brilliant storytelling. Fascinating history. And an opportunity to wrestle with important social and religious issues. Friends, this is definitely a must-read, must-share story. The review copies were kindly sent by the publisher, Penguin. If you make a purchase using the Amazon links on this site, a small portion goes to Great Kid Books. Thank you for your support. My students love graphic novels, and I love the way they engage kids in reading and thinking about stories. This year, two graphic novel series are particularly expanding the way I see graphic novels, incorporating science & technology in this visual storytelling format: Secret Coders and Science Comics. Both of these encourage kids to learn about scientific concepts, through a medium that they love. 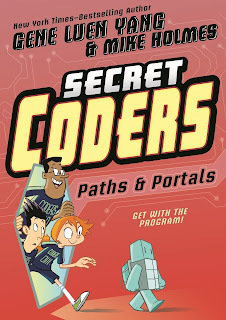 In Secret Coders, readers follow a team of kids who use coding, team work and perseverance to solve mysteries at their school, Stately Academy. Hopper, Eni and and Josh discover that the custodian Mr. Bee is actually a genius who used to run a secret, underground school hidden below Stately Academy. Through trial and error, they figure out how computer programming works to make repetitive jobs easier, create interesting artwork and even trap villains. Kids in our library love the logic puzzles that coding encourages them to figure out, and they're going to love working with Hopper and her friends to solve these puzzles too. Yang's visual storytelling provides the perfect hook for understanding the logical structure of coding. Each volume of Science Comics balances complex topics with humorous cartoon characters, engaging kids and helping them understand the scientific concepts. In Coral Reefs, a bright yellow little fish eagerly introduces readers to his home, explaining everything from how coral grows to the diverse ecosystem that reefs support. 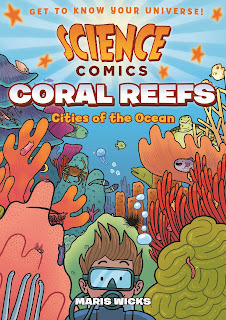 Coral reefs are home to an incredible variety of species, and Wicks clearly introduces readers to a huge range. She also explains why this diversity is so crucial to protect from pollution, habitat loss and global warming. Yet the humorous asides and cartoon illustrations help keep the tone light and friendly, never didactic. Definitely a series that will get kids wanting to learn more. 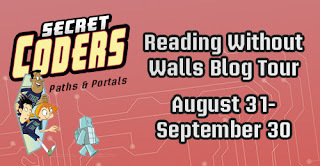 Please join me today, celebrating the Reading Without Walls Blog Tour. Gene Yang put forward the challenge to teachers, librarians, parents and kids to expand their world by reading something different -- different from their usual reading choices, with different characters or about different topics. The review copies were kindly sent by the publishers, First Second / Macmillan. If you make a purchase using the Amazon links on this site, a small portion goes to Great Kid Books. Thank you for your support. Do you remember the song, "Make new friends, but keep the old. Some are silver, and others are gold." As our kids settle into a new school year, let's help them think about how important it is to make new friends, being kind and inclusive. 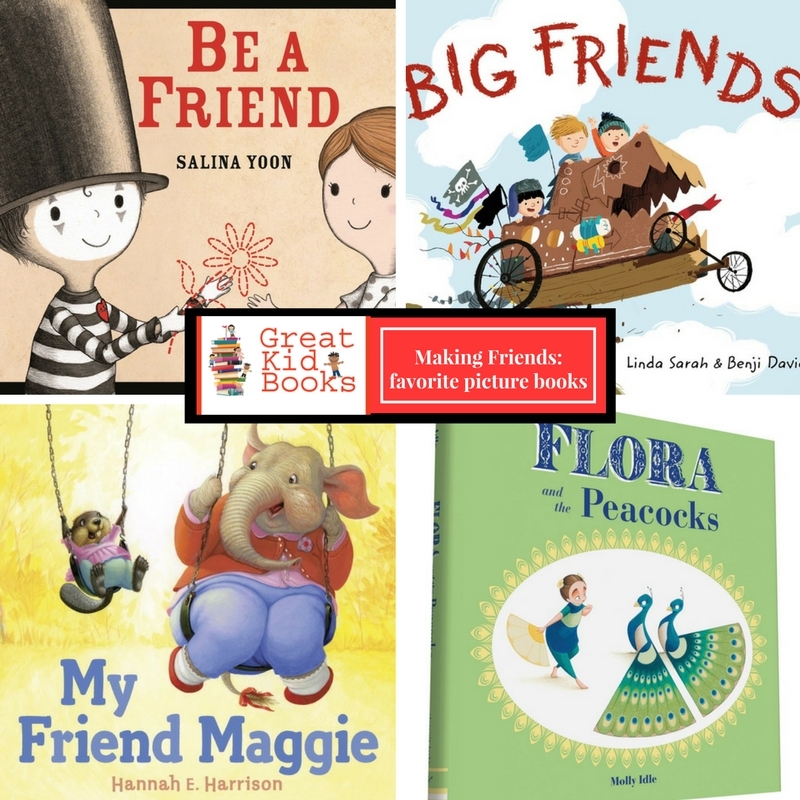 Here are some new picture books all about making new friends. Be a Friend, by Salina Yoon: This adorable friendship book follows Dennis, a little boy who only communicates through miming. One day at school, he kicks an imaginary ball and--to his surprise-- his classmate Joy catches it! A delightful story about finding a kindred spirit and discovering a new friend. Big Friends, by Linda Sarah, illustrated by Benji Davies: Best friends Birt and Etho love playing pretend with cardboard boxes every day--racing, battling pirates, constructing forts. When another boy joins them, Birt retreats home sulking, until Etho and his new friend use their imagination to create an invitation Birt can’t resist. Flora and the Peacocks, by Molly Idle: Flora dances with two elegant, proud peacocks in this wordless picture book--navigating the friendship between three. When one peacock starts dancing with Flora, the other feels left out--sound familiar? Molly Idle’s expressive illustrations depict a full range of emotions, letting children tell the story in their own words. 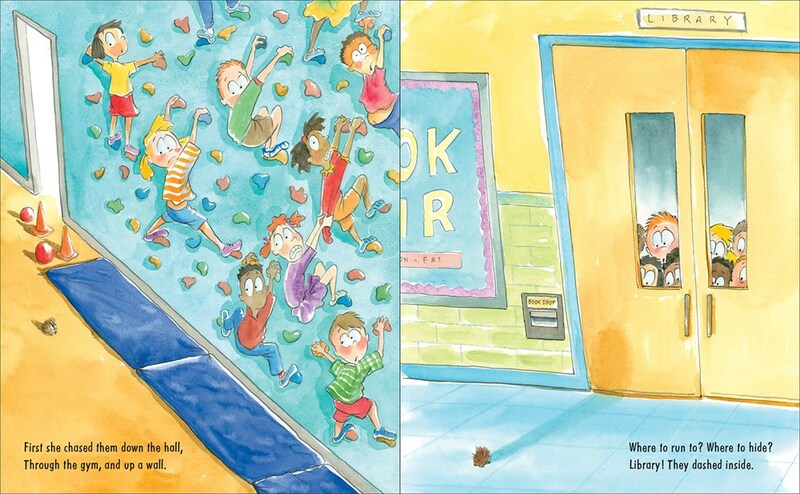 My Friend Maggie, by Hannah E. Harrison: Paula and Maggie are best friends, but when this duo (a beaver and an elephant) encounter a bully at school who teases Maggie because of her large size, their friendship is put to the test. At first, Paula gives in to peer pressure and shuns Maggie; but in the end, she realizes that a true and loyal friend is the best sort you can have. There are many many friendship picture books that are wonderful to read with kids. Do you have any favorites? The review copies were kindly sent by the publishers, Bloomsbury, Macmillan, Chronicle, and Penguin. If you make a purchase using the Amazon links on this site, a small portion goes to Great Kid Books. Thank you for your support. When Raina Telgemeier recently held a reading at the Berkeley Public Library, over 500 young fans turned out to see their favorite cartoonist. 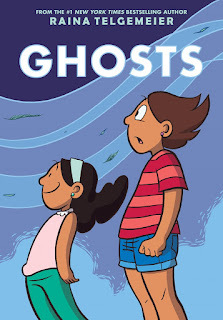 My students are super-excited that Raina's newest book Ghosts hits the shelves today! Bay Area settings play a prominent role in many of her graphic novels, especially here. To celebrate, I'd like to share my review of Ghosts and a short interview I did with Raina. When Cat and her family move to a foggy, windy Northern Californian town, she worries that the town’s obsessions with ghosts portends something dangerous and harmful. Cat's little sister Maya has an incurable lung disease cystic fibrosis, she is insatiably curious about ghosts and loves the town's coming celebration of Day of the Dead. Will Maya be soothed by the town's cool, misty weather or do the ghosts threaten to take her away from Cat? As the story develops, Cat discovers more about the town’s celebration of the Day of the Dead and her own Latino heritage. 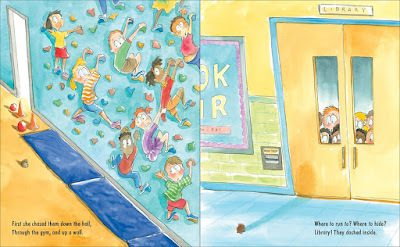 I especially love the way Raina layers poignant, important messages about family, courage and facing fears. You create such a relatable character in Cat. I'm curious what part of “Ghosts” draws on your own experiences, and what is creating a new character and story? Raina: Cat shares my anxiety. I have a lot of fears and phobias, from things that go bump in the night to much deeper issues within myself. Some of these, I worked through on the page, but otherwise Cat and her surroundings are fictional. Her little sister, Maya, who has cystic fibrosis, is in part inspired by my young cousin who became terminally ill when she was 12. Sabina was an incredible, spirited, unstoppable kid, and Maya definitely shares some of her light. I love how you capture the Northern California coastal setting. What town and experiences influenced this? Raina: Bahía de la Luna isn’t a real place, but it was inspired by a mash-up of Half Moon Bay, Santa Cruz, Moss Beach, Monterey, and Morro Bay. And a little Santa Ana for good measure, even though that’s in Orange County. I grew up in San Francisco, but my family loved exploring the oceanside towns all over the Bay Area. My students are particularly interested in the way Maya copes with cystic fibrosis. What inspired you to make this part of the story? 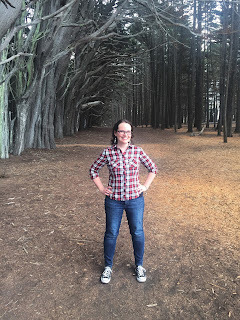 Raina: Cystic fibrosis is a disease that directly affects a person’s ability to breathe, and breathing is a huge theme in the story: ghosts don’t breathe, so Maya feels like she can relate to them. And Cat’s anxiety means that she sometimes forgets to stop and breathe deeply, herself. Thank you so much, Raina, for taking the time to share with us about Northern California and your wonderful story. I love this video where Raina shares both the Northern California settings of Ghosts and a little bit about the story. The review copies were kindly sent by the publisher, Scholastic. If you make a purchase using the Amazon links on this site, a small portion goes to Great Kid Books. Thank you for your support. As we remember and reflect on the 15th anniversary of the September 11th attacks, it's important to recognize that this is history--not memories--for our 4th and 5th graders. How do we share this history with our children? How do we share its impact on our lives and our world? 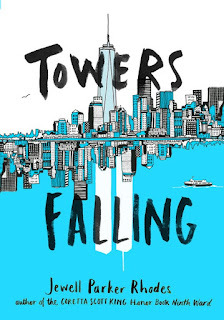 Jewell Parker Rhodes wrestles with these issues in a compelling, heartfelt way in her novel Towers Falling. Dèja's father is having nightmares again, groaning and tossing in his sleep. Their family has just moved into a homeless shelter and Dèja will start fifth grade in one more new school. Her father is ill and her mother's waitressing job barely pays for their food. Dèja starts her new school, the Brooklyn Collective Elementary, defensive and ready to push back on anyone who gives her a hard time, squinting her "don't you make fun of me" face. Although she's defensive and guarded, her teacher is supportive and Dèja's welcomed by students, making two friends. When her fifth-grade begins studying the events of September 11th, Dèja's confused--she's never heard of the events and she's frustrated that everyone else seems to know more than she does. With a diverse cast of characters, she (Jewell Parker Rhodes) brings contemporary New York City to life, reveals the struggles of millions of Americans who comprise the working urban poor, and pays homage to the first responders and survivors who still battle deteriorating health and PTSD. Dèja recognizes that “America is my history. My story. Not just ‘Homeless Dèja.’ I don’t know how yet — but the towers falling is my history, too” (p. 128). By drawing readers into Dèja's journey, Jewell Parker Rhodes shows how history not only is made of past events, but it also forms the fabric of our lives and communities today. More than that, she shows readers how understanding each other and caring for one another helps us become more resilient to the challenges life presents us. As I reflect on this story, I'm reminded of the study in the journal Science that showed how reading literary fiction helps people be empathetic and understand other's emotions. Young readers will be drawn into Dèja's compelling story--understanding her feelings about home, family, friendship and how history can impact us all. The review copies were kindly sent by the publisher, Little Brown. If you make a purchase using the Amazon links on this site, a small portion goes to Great Kid Books. Thank you for your support. 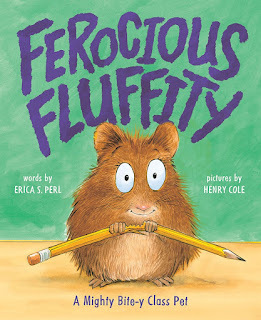 Right from the get-go, readers will know that Erica Perl wants them to question whether Fluffity is indeed as cute as her name suggests. And her subtitle, "a mighty bite-y class pet" gives a clue about the way she plays with rhymes. The cover only hints how uproariously funny this story is--just wait till Fluffity gets loose. Mr. Drake's second grade class is so excited when Fluffity arrives as their new class pet. Kids call out, "She's so tiny." "She's so sweet! "/ "Such cute whiskers!" "Such cute feet!" Mr. Drake warns them that they have to wait to hold her, but every kid is yearning to hold her. "The box was big and tall and wide. Could there be a pet inside?" "Look--don't touch," warns Mr. Drake, "Though the children nodded yes, / Did they mean it? Take a guess." Just a few days later, Mr. Drake is late and the class decides to take out Fluffity, passing her around. Right then, the class discovers her true FEROCIOUS nature--biting and chasing everyone down the hall and into the library! "No one's sure who held her first. Things got bad. Then things got worse." "Perl handles her rhyme with panache, using it to up the frenzied action and to increase the humor as well. The rhyme adds a galloping pace to the book that is wonderful as well as making it a treat to read aloud." Henry Cole's illustrations amplify the humor, with student's cartoon faces and astonished expressions. 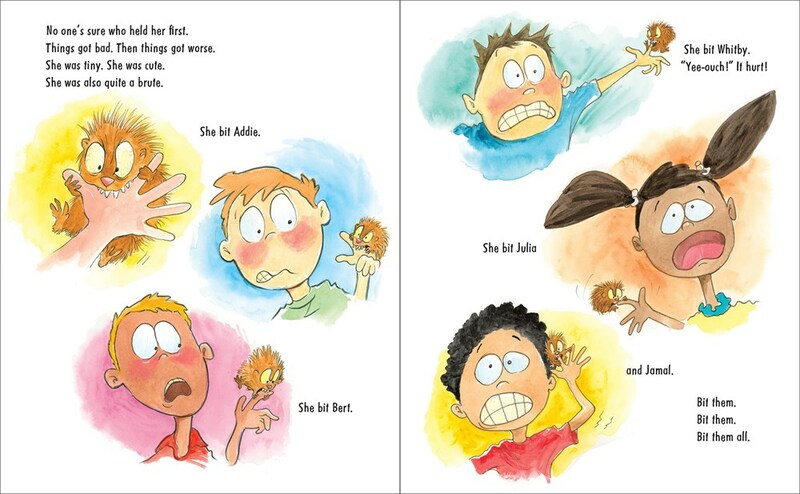 Kids will love how he contrasts Fluffity's tiny size to the kids' panicked reactions. 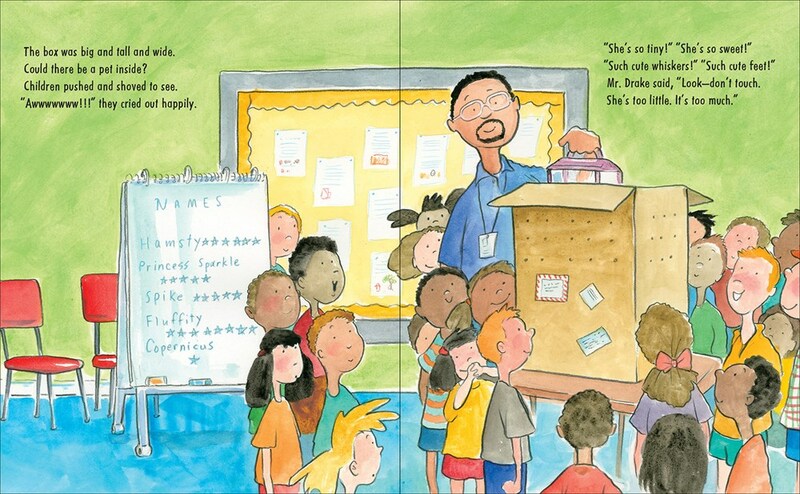 His diverse classroom, with its African American teacher, make this even more relatable. Through the gym, and up a wall." Illustrations copyright © Henry Cole, 2016, shared with permission of the publisher. The review copies were kindly sent by the publisher, Abrams Books for Young Readers. If you make a purchase using the Amazon links on this site, a small portion goes to Great Kid Books. Thank you for your support. Reading can be tough work, so I often try to give developing readers a big dose of humor to keep them engaged in stories. These new readers also need a story that develops in a predictable way, so they can build a solid understanding of the plot and characters. 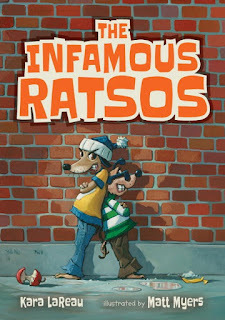 The Infamous Ratsos, a new chapter book, hits the sweet spot--providing humor and a story that's engaging, but easy to follow. Louie and Ralphie want to be tough just like their dad, Big Lou. "There are two kinds of people in this world," Big Lou likes to say. "Those who are tough, and those who are soft." Louie and Ralphie decide they're going to show everyone just how tough they are. 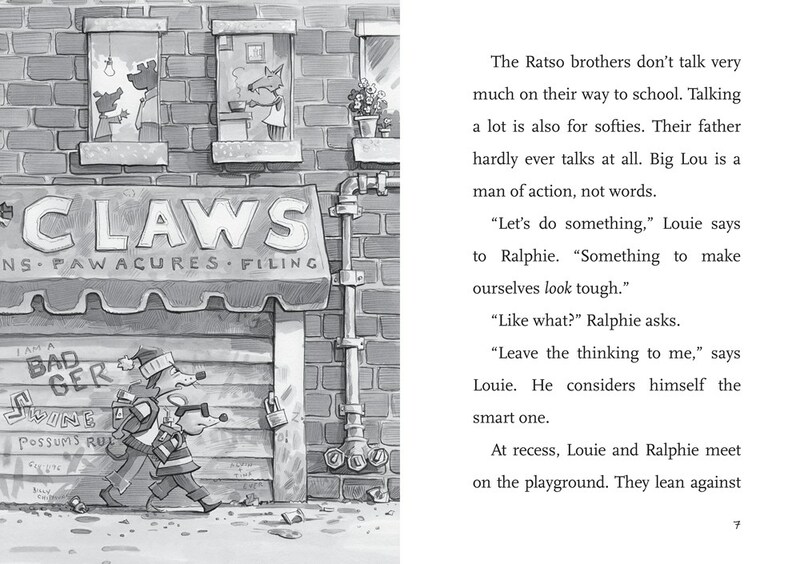 "Let's do something," Louie says to Ralphie. "Something to make us look tough." The brothers decide to play mean tricks on other people in order to look tough. On the playground, they steal big badger's hat on the playground, trying to look like playground bullies. But it turns out that they've rescued Tiny Crawley's hat which the badger (the real bully) had stolen. Nothing ever comes out quite like they plan--instead of doing dastardly deeds, they help people. "That was nice of you boys, sticking up for Tiny," says Miss Beavers. But no one is listening. Instead, everyone on the playground is looking at the Ratso brothers like their heroes. Short chapters, frequent illustrations and large font make this book well suited for developing readers. 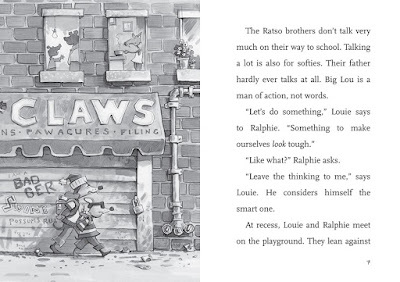 In four successive chapters, Ralphie and Louie try to do mean things and show everyone just how bad they are. Young readers will enjoy finding how things will turn out badly for the brothers, and soon will start predicting their mishaps. I especially enjoyed the ending, when their dad finds out about how they've been helping people at school and in the neighborhood. LaReau has laid the groundwork--Big Lou's reaction isn't just that of a tough guy. He has a soft heart, too, especially when he thinks about Mama Ratso, who's been "gone" for a little while now. "Being tough all the time is so... so... tough," says their father. He puts his arms around the Ratso brothers and pulls them close. This beginning chapter book, similar in difficulty to a Frog and Toad book, will engage developing readers with its humor and twists, providing nice moments for talking about what the brothers learn in the story. A great choice for late 1st grade or early 2nd grade readers. Here's hoping for more trouble from the Louie and Ralphie. Illustrations copyright © Matt Myers, 2016, shared with permission of the publisher. The review copies were kindly sent by the publisher, Candlewick. If you make a purchase using the Amazon links on this site, a small portion goes to Great Kid Books. Thank you for your support.